Oh now I am having fun. 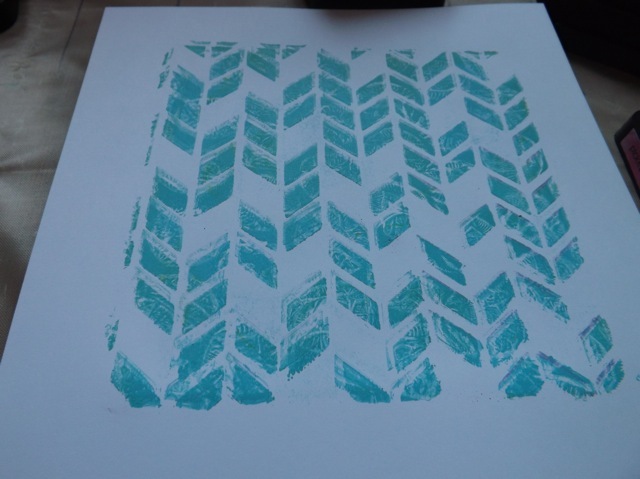 but I found if I then brayer over that it totally smooths out the ink without removing too much of it. It still seems to me to give much deeper coverage than simply brayering on the ink. And it is QUICK. 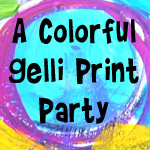 You can cover as large an area as the Gelli plate in a flash, and using less ink than you would if you were to laboriously sponge and blend the DI. 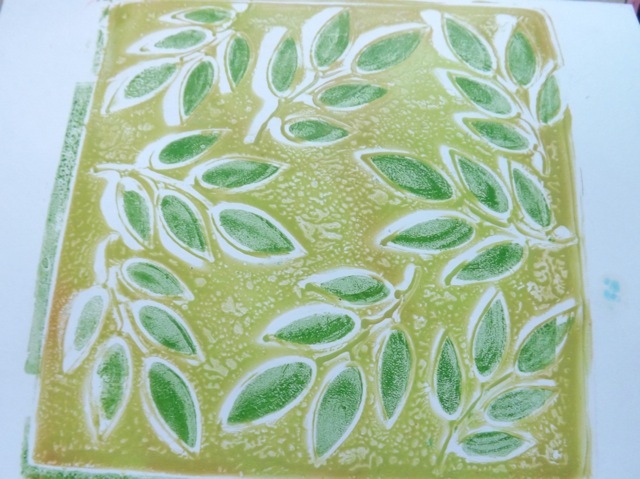 I’m curious to try pressing on different colours of ink then brayering to see what effect I get as they “mix” on the plate. 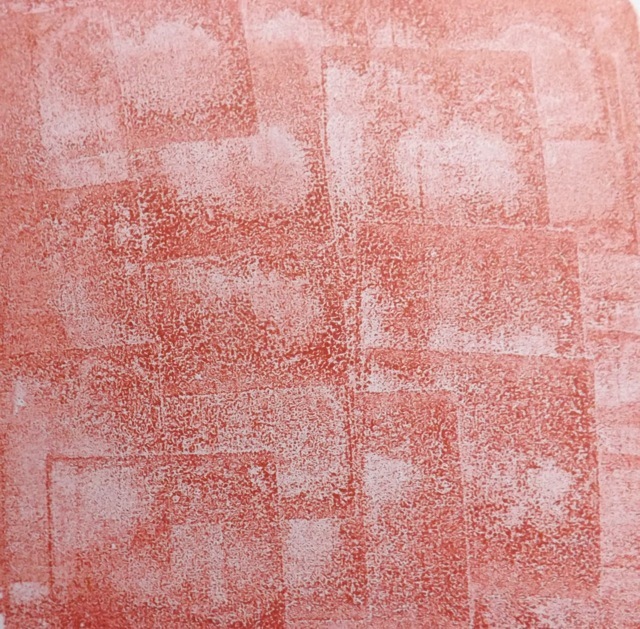 Just a quick card background – I ran the ink-filled brayer over a foam stamp and then pressed that on, and ditto a grid texture plate. 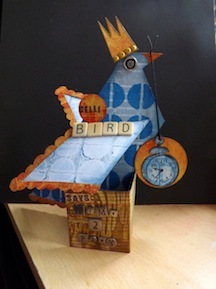 A ribbon and a topper and card done. Took literally two minutes to do. 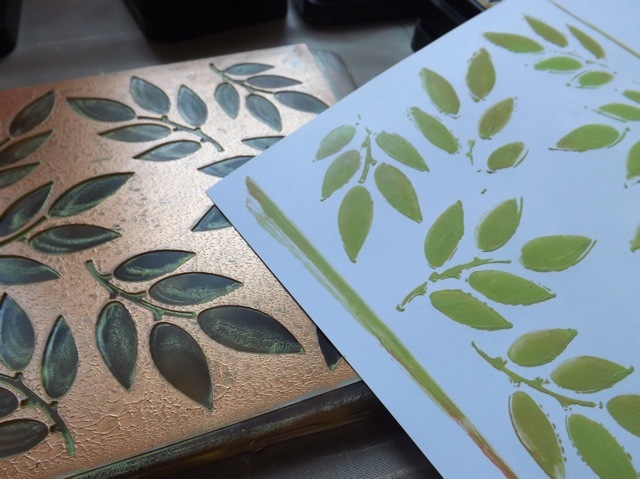 fill the gaps with ink – and as there will be paint left on the plate use the brayer rather than pressing the ink pad to the plate or you will get paint on your ink pad – not good! Then pull. Mine shifted a bit due to too vigorous pressing to clear out as much of the paint thru the stencil gaps as I could. even so, you get the idea. 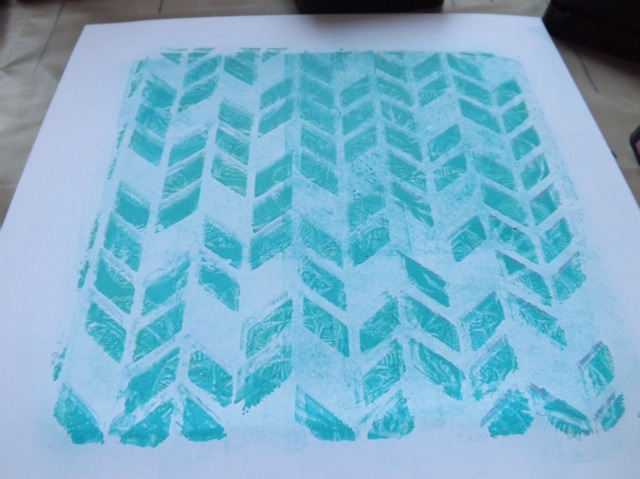 This time I decided to see if I could both clean off the brayer and get a second piece by laying the reverse side of the first pull on to the paint+ink pull and using the inky brayer on the back. 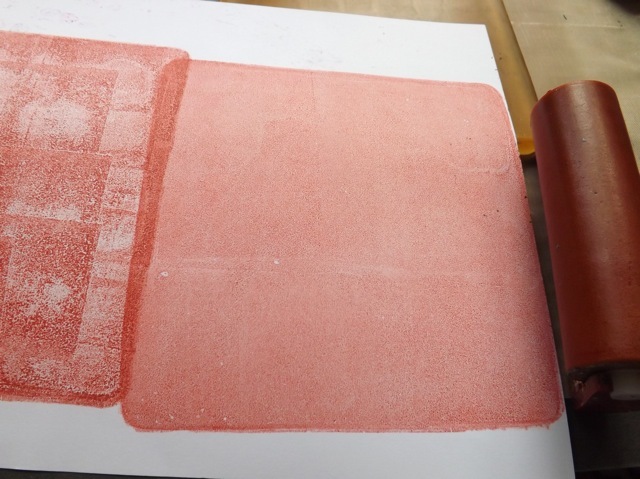 It cleaned the brayer of ink and filled the gaps around the first pull. Where this would be useful is if you needed a double-sided print, like for a mini book, or if you wanted to cover both sides of an envelope with a similar colour/pattern! Now this is cool. 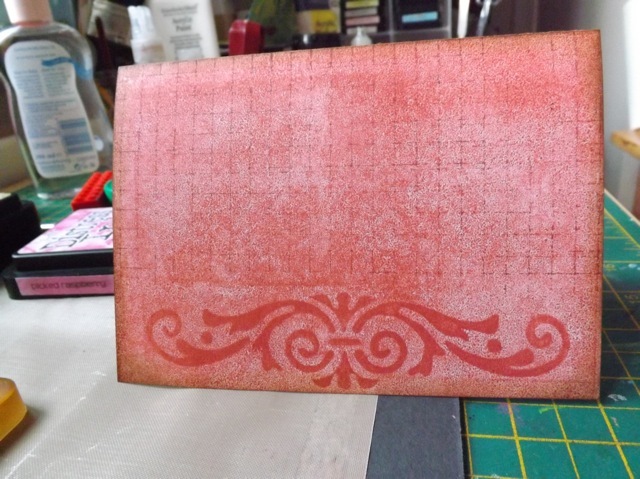 I didn’t clean off my stencil from when I pressed on the DI in one of yesterdays samples. 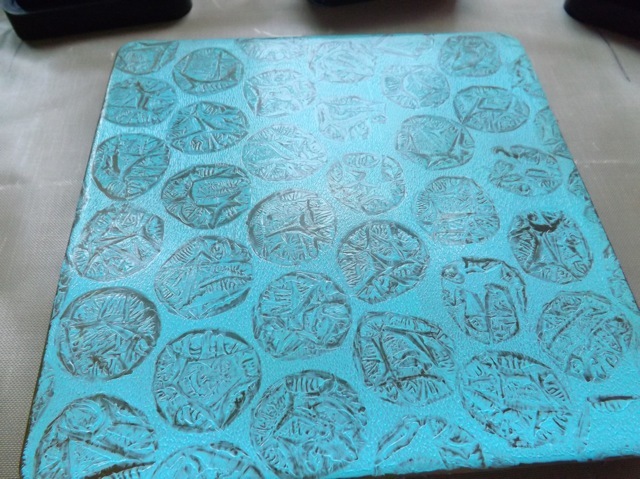 So although the ink was DRY on the stencil, pressing it to the paint reactivated it somehow to give me a really pretty effect. I REALLY like that one. I like the fact that the inky part if both textured looking and has the little halo around it. That is a happy accident, and better that just pulling a paint print with open areas and smudging on DI over it IYKWIM. 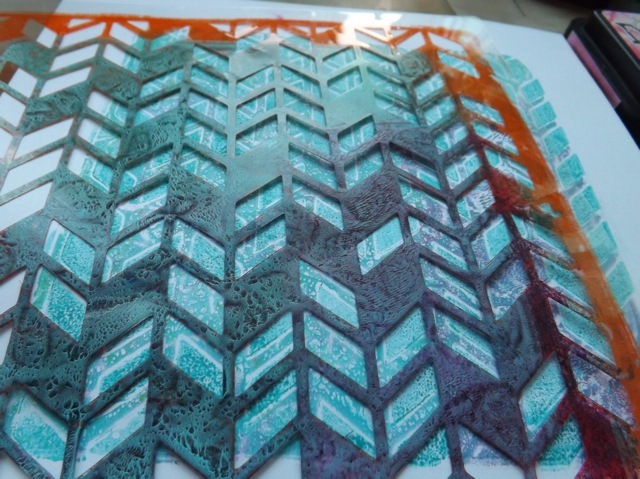 What might make it even more interesting is to now try some sort of next layer that capitalizes on the properties of Distress Ink – like the fact it is reactive with water. So you could, for example, write with a water brush on the DI areas then heat it let the ghostly writing emerge (neat for an AJ page, I think, but perhaps not with this particular print as maybe the areas are too small) or stamp over it with water so the inked part gets the bleached out image but the PAINT areas stay solid. Or even flicking on water droplets to make the inky part even more splotchy. 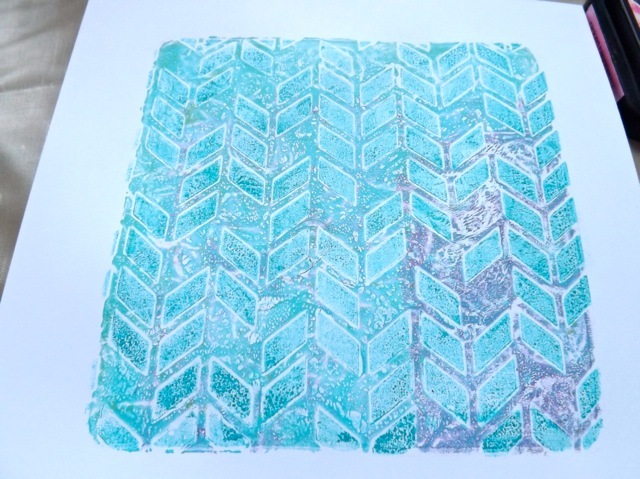 Maybe stamping over it with dye ink then wiping off the ink from the paint, which should resist the ink, so you get a sort of masked effect…. SO many things to try, so little time. If you try them do let me see your results. 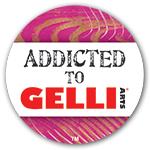 Categories: art, Gelli plate monoprints, tutorial | Tags: art techniques, Gelli, Gelli plate, how-to, inks | Permalink.